Cover design by Gabriele Wilson. 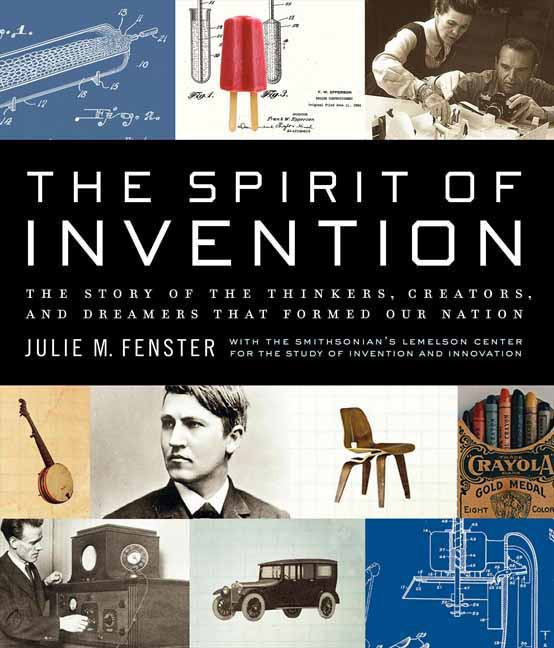 The Spirit of Invention is a fascinating examination of innovation as a driving characteristic of Americans from all eras and all walks of life. In this book we meet Gertrude Forbes, a sickly widow so poor she had to live in her aunt's attic, who overcame the odds to invent, among other things, an adjustable ironing board cover. We follow Cromwell Dixon, a fifteen-year-old from Columbus, Ohio, whose dreams of finding a way to fly inspired him to invent a bicycle-powered airship. We see John Dove, an African-American inventor, originating concepts integral to the compact disc. We learn about Purdue University, one of the earliest educational institutions to promote invention and engineering ideas. We eavesdrop on Thomas Edison in his laboratory in Menlo Park, New Jersey, and also find out about the beginnings of film colorization, a controversial process that adds tint to film. And we read about Luther Burbank and how he revolutionized plant breeding. The book even reviews the invention of illegal devices such as the "light wand," which induced slot machines to pay out on every spin, and we are introduced to a poker player who invented a "holdout" that allowed him to conceal cards in a shirt sleeve during games. The Spirit of Invention is the tale of America's history of innovation, told in an engaging narrative style by a captivating historian and storyteller. Supported by a vast collection of archival material—photographs, newspaper clippings, and illustrations—Julie M. Fenster captures a group most Americans know nothing about: the dreamers and thinkers who found the need for a product, be it practical or fanciful, and saw it through to its creation. The book is an entirely fresh and fascinating examination of innovation as an innate force, inspiring unsung people to do magnificent things. In Fenster's own words, "Invention is more than just an occasional necessity for human beings; it is an impulse that helps to define the species. It emerges in the individual as a reaction to the splendid frustration of one's surroundings, a response as basic in most people as having children: to leave a mark and give a gift, perchance for the better, to the future." This is the inside story of the true innovators of our nation.